Benjamin Franklin’s love for storms was the driving force that led to his invention of lightning rod based conduction of electricity. In 1746, Franklin was closely watching the work of other scientists in Boston and their experiments involving electricity. Following suit, he opted to venture into some lab trials of his own throughout 1747. Using household items, he proceeded and documented his findings—which were, as it would turn out, quite literally shocking! By mistake, he famously got jolted by electricity during his experimentation. Ben began referring to the vitreous and resinous terms that were used by prior scientists alternatively as plus (positive) and minus (negative), respectively. Although he was not certain how it could be put to use, Franklin explained in a letter to Peter Collinson (a Londoner to whom he was submitting his work for possible publishing) the idea of an electrical battery. This was in spring, 1749, the same year that he noted the commonalities between electricity and lightning. Other scientists had theorized this as well, but Franklin was set on figuring out a way to prove it as fact. That year, Ben had noticed that an iron needle with a sharp point attracted electricity away from a metal sphere with an electric charge. One theory he had was the lightning could be deflected from the earth by using an iron rod placed high in the sky in order to remove static from clouds. For this reason, he promoted the use of lightning rods with sharp points. However, colleagues of his in England were more in favor of ones with blunt tips. They believed the blunt rods had a lower probability of being struck. In Philadelphia in June 1752, Franklin became impatient while waiting on a steeple to be built on above Christ Church in order to conduct his experiment. As an alternative, he opted to try using a kit with something attached to it which could attract electrical charges. He chose a metal key which he connected to his kite. He then tied the string of the kite to a silk ribbon as insulation so his hand that held the kite string would be less likely to get a shock. His experiment was quite dangerous but he surprisingly did not get hurt. When the key was directly struck by lightning, it was then that Franklin realized it was indeed electricity. 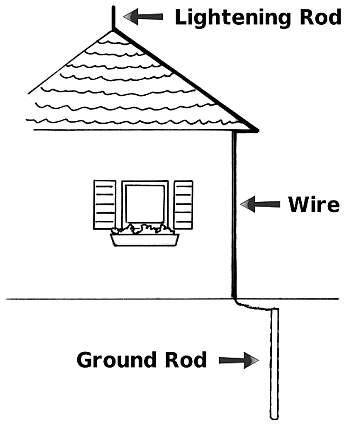 Franklin’s lightning rods began to be used to protect quite a few homes and buildings. The largest one was placed on the Maryland State House on its dome. These rods began to be thought of as a symbol of the ingenuity and brilliant mind of Benjamin Franklin, as well as the potential for innovation and progress that America possessed as a nation.